If you’ve ever played fantasy or daily fantasy football with any degree of vigilance, you know what it’s like trying to keep up with all of your drafted players. 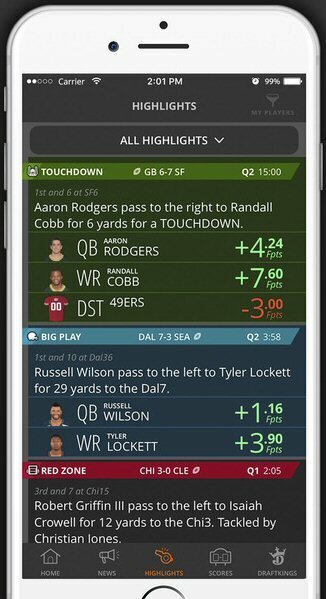 You watch the 8-Game Mix or NFL RedZone, while scrolling through stats apps on your smartphone and tracking live scores on your laptop or tablet, all at the same time. The people over at DraftKings know exactly what that’s like, and they’ve introduced a new DFS mobile app that will surely simplify the lives of their most dedicated members. It’s called DK Live, and it delivers all of the big plays, the scores, and those pivotal red zone moments, all in one place. DraftKings is promoting the DFS mobile app as a digital version of “NFL RedZone”, specifically geared towards daily fantasy football fans. Because the truth is, there is a big difference between your average football fan – the ones who want to see every score and highlight from every game – and fantasy football fans – who are only interested in scores and highlights that involve the players they’ve drafted for that week. That’s exactly what DK Live brings to the table, all wrapped up in one nice, free, 32.4 MB package. We’ve already discussed most of the features in brief, but there’s more packed into this DFS mobile app you’ll want to know about. In the Highlights section, DK Live offers players a ton of filters to see only the stats they are most interested in, like touchdowns, field goals, turnovers, redzone plays, or any play that involves a 20+ yard gain. Over in the Scores section, players can view all scores for all games, updated in real time. Alternatively, a user can watch a single-game scoreboard with play-by-play feeds. Tapping on News gives players up-to-the-minute information on the latest player news and injury updates from major sports new sources like FantasyLabs, RotoWire and more. DK Live also offers analysis on injured players to examine the projected impact on a game or season. Customization is by far the most significant feature, and the one that dual users of the DraftKings and DK Live mobile apps will surely appreciate most. Any daily fantasy football participant can manually filter the results to see only players and teams they are interested in, but for those who also use DraftKings, they can instantly filter only their drafted selections for that week. The DFS mobile apps are separate, meaning you can’t login, draft your players, then watch the highlights on a single app. But that isn’t necessarily a negative. Narrowing your usage of multiple devices – television, apps and websites – down to just two apps that get the job done will surely be appreciated by sports fans. Overall, I’ve only found one real negative for DK Live thus far, and that’s mobile optimization. Unfortunately, the DFS mobile app is only available for Apple iOS devices at this time. 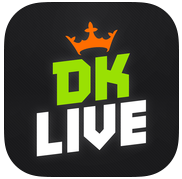 You download DK Live free in the Apple Store right now, but there’s no Android or Windows Phone edition available yet. According to sources, an Android version will be released somewhere down the line. There’s no word on optimization for other mobile operating systems to come.